The first proposal to stimulate the study of“movements of glaciers” in Italy came from Prof. Francesco Porro, member of the Cremona division of the Club Alpino Italiano (CAI). 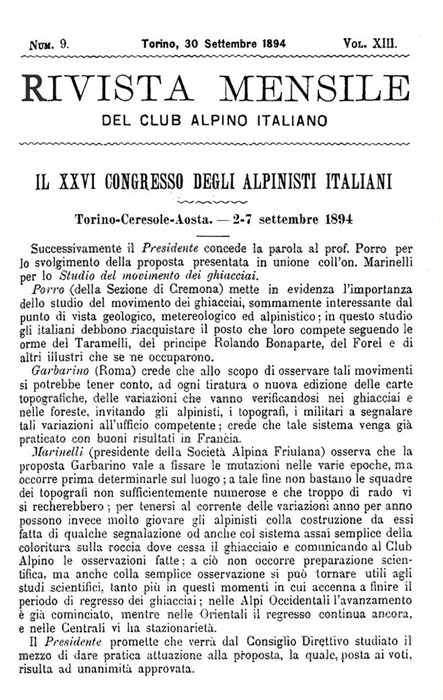 This came in the framework of the “XXVI Congress of Italian Alpinists” held in Turin (2nd Spetember 1894) in the Valentino Castle, seat of the Committee. As proof of the success of this initiative, and on the basis of a favourable vote among the participants to this event, the CAI executive committee named in 1895 a “Commission for the study of glaciers”. This newly-elected commission formally composed by nine members, met for the first time in Turin on 24th March of the following year, for the drawing up of a Questionnaire (PDF) and of the instructions for the study of Italian glaciers during the alpine survey of 1895. These documents had to be distributed to guides, to alpinists, and to whom for some reason have occasion to cover areas occupied by glaciers and moraines. The first issue of the “Bollettino del Comitato Glaciologico Italiano” (Italian Glaciological Committee Bulletin) came out in 1914. Since then, the Bulletin represented the tool for information about the annual scientific activities and the institutional life of the Committee, although some changes to its layout were made. In 1931 the Italian Glaciological Committee was hosted by the Geology Institute of the Royal University and moved its seat to Palazzo Carignano, where it remained until 2005. Only recently, it moved to a new seat located in the building of the former “Galileo Ferraris Electronic Institute”. The most important scientific steps are reported at the end of the text. It must be emphasized, however, that only the dramatic events of the 2nd World Was perturbed to a certain extent the continuity of the scientific activity of the committee. As example, the photographical archive located in the building of the Royal Polytechnic in Turin was completely lost under the bombardments of the allies. 1978 – While the tradition of the CGI Bulletin continues, the first issue of the journal “Geografia Fisica e Dinamica Quaternaria” (“Physical Geography and Quaterary Dynamics”) appears.